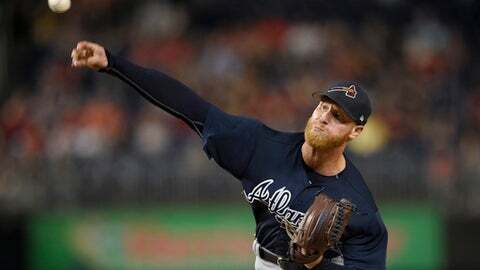 PHOENIX (AP) Pitcher Mike Foltynewicz went to salary arbitration with the Atlanta Braves over a difference of $100,000, the smallest gap in a hearing since 1994. The 26-year-old right-hander asked Gary Kendellen, Mark Burstein and Walt De Treux for a raise from $544,000 to $2.3 million in his first year of arbitration eligibility. The Braves argued for $2.2 million during Friday’s hearing. Oakland pitcher Kendall Graveman also went to a hearing, asking James Oldham, Margaret Brogan and Jeanne Wood to lift his salary from $545,000 to $2.6 million instead of the Athletics’ $2.36 million offer. Players have a 7-4 record with three decisions pending and nine hearings scheduled for next week. The case involving Cleveland pitcher Trevor Bauer, which was heard Thursday, will not be decided until late next week. That will be after hearings for Baltimore’s Kevin Gausman and Toronto’s Marcus Stroman, pitchers who also have at least three years of major league service but less than four. Foltynewicz was selected by Houston with the 19th overall pick in the 2010 amateur draft and was dealt in January 2015 as part of the trade that sent Evan Gattis to the Astros. He was 10-13 with a 4.79 ERA last year in a career-high 28 starts and one relief appearance. He is 23-25 with a 4.87 ERA in parts of four major league seasons. The previous case involving a gap that small was when New York Yankees first baseman Kevin Maas was awarded a raise from $225,000 to $425,000 rather than his $490,000 request. Graveman, a 27-year-old right-hander, was 6-4 with a 4.19 ERA in 19 starts, going on the disabled list due to a strained right shoulder from April 15-25 and May 26-Aug. 2. He was 10-11 with 4.11 ERA over 31 starts in 2016.